7 Quick Takes: Rebuilding and Renewing – Y is For Home! 1. Tearing down the house and putting it back up again was so hard! Oh my goodness I’m still exhausted..that might be due in part to last night’s mini-sickness – both kids woke up a few times to vomit a bit and then sadly drift back to sleep – I didn’t get to sleep in between episodes of sickness though, and they we awake and nestling in bed with us by 5, so yeah, exhaustion. But the house-cleaning was a huge undertaking..that canvas roof is super heavy! We scrubbed the interior walls, aired everything out, wiped down wood, and painted the wall panels before putting it all back together again. Now Seth is painting the ceiling and rebuilding all our problematic essentials, like the door. We have a tapestry up now to give the impression of a door. Between all the house-stuff and homeschooling, we’re insanely busy these days, hence the neglected blog..but my house is going to look amazing this fall and winter! So it’s all worth it. 2. I’m delving into a new level of homesteading this year..fermentations! We’ve made saurkraut and sour pickles before, but right now, I’ve got a kombucha SCOBY growing, beets, carrots, and onions lacto-fermenting on the shelf, pickles and dilly beans perched up beside the flour, saurkraut in the big crock on the floor, and a new sourdough started doing it’s thing on between the jars of fermenting roots. Oh, and honeys too: garlic, peach, blackberry and tulsi, basil, and rose-hip honeys in the pantry. It’s an exciting time! We’re stocking up on things for late fall and winter, trying to be more homesteady and less self-indulgent, and loving it all! 3. I’m also steeping some Fire Cider for winter healings: peppers, onions, garlic, rose-hips, the last of the bee balm, ginger, turmeric, horse-radish, and a golden beet are all chopped up and drowning in apple cider vinegar. This stuff is such a germ-killer, I can’t wait to have it all bottled and dose-able. 5. It’s a tight-budget season for us as well. There is so much to do in preparation for winter, and so many repairs and replacements happening that despite some awesome work, it’s a tight time financially. Not painfully tight, just one of those times that has me putting off enthusiastic purchases that will renew everything..good training in learning to want less and make do with more! 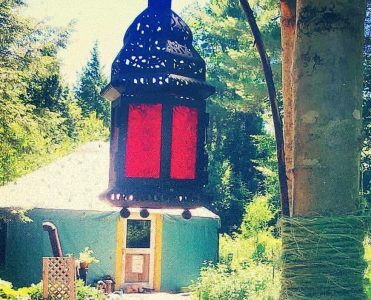 My husband is fantastic at this, he always finds something to use in building something new – our goat-shed was built entirely with material we had on hand, and he’s doing the same with most of our yurt renovations! He’s just amazing! It’s actually (as dorky as this might sound) an inspiration to watch him change something worthless into something beautiful. 6. We haven’t moved everything back into the yurt, and I don’t think we will. I am in love with all the space and the open walls, I want to bring things in very, very slowly, find a home for each object and stop when the house feels done. I don’t want my house to be full of distractions and toys and little bits of whatever. I have nothing under my bed right now and it looks so good!! And the kids can play under there, Luba can sulk under there, it’s such a nice little spot right now. I want it to say nice and clean and happy. So I think this is the time to go forward with minimalism. No more half-hearted little purges, so much is going out the door forever this fall! Good-bye toys, good-bye 2nd and 3rd copies of books, good-bye unrepairable bits of pottery! And at some point, goodbye clothes I’m only partially attached to, but right now, with 90% of my wardrobe falling in that category, I’m putting off the big-clothing-purge. Sometime before the new year though, I am determined! 7. I might take another social retreat this winter, maybe start off the New Year with one. Has anyone done this? Time away with no visitors, limited tech – I had phone hours last time, and the rest of the time my phone was off, off facebook, very intentional blogging times and essentially just a lot of solitude with my little family and Jesus. It’s seriously one of the most reviving things I’ve ever done. I really want to make it a regular practice, but I’m not sure of an ideal time. The new year seems like a nice choice…what do you think? Oh how lovely! I’m seriously wanting to do all of this! As well as the break from the world, but just starting my little business makes that hard. I love your blog, and your inspiration for me to be more intentional in my life in many areas! Thank you! I love seeing your business start up! It’s absolutely lovely! Thanks so much for taking the time to follow and get to know me, you’re a pretty inspirational person too! It’s great to see you blogging again! Honestly, though, I totally understand your absence – late summer is always a busy time for us as well. What really brought me to comment was you talking about improving your family’s diet – lately I’ve been convicted in this area as well, especially about reducing our sugar intake (we don’t eat a lot of processed foods, but I love to bake, and probably do it a little too often). I think I’ve mentioned before that I love to talk about books, right? Well, I also love food, and of course those two interests (obsessions) overlap and manifest as my excessive cookbook collection! ‘Nourishing Traditions’ is one of my favorites, although I don’t use it as much as I should, as it can be fairly daunting to me (have you ever heard the Carl Sagan quote, something along the lines of, ‘If you want to make an apple pie, you first have to create the universe’? Well, I know it’s talking more about how everything is interconnected rather than about actual recipes, but yeah, some of the recipes in that book feel that way to me :P) Have you ever heard of/read ‘Full Moon Feast’? It is a traditional cookbook with recipes arranged thematically according to the 13 full moons of the year, with an essay to introduce each chapter. I know I don’t actually know you, but through what I understand about you through your blog it seems like the sort of book you would enjoy! I love it, and make plans to reread it every year which are always destroyed by my never-ending book list…..A couple more are ‘Nourishing Meals’ and ‘The Whole Life Nutrition Cookbook’ by Alissa Segersten. This author and her family are gluten free (my family is definitely not), and I believe most of the recipes are dairy and soy free as well, (but we all know how easy it is to add dairy if one is so inclined, ha). While I am not overly concerned with the eliminations, I do cook from these books probably more than any other cookbooks I own, simply because the recipes taste good, are geared toward families so the kids eat them enthusiastically (for the most part), and I am confident that I truly am serving nourishing, healthy food in the best sense of those words. (Isn’t it sad how difficult it is to do that?) In one of these books, each of which have a nice variety of fermentation recipes, there is a recipe for a cauliflower/lemon/rosemary pickle that is my new favorite……Other recommendations: ‘Feeding the Whole Family’, ‘Nourished Kitchen’, and ‘Savor’ (definitely a coffee table book and thus more of an extravagant purchase, but truly traditional recipes and soooo beautiful to look at). I’m sure there’s more I could recommend, but honestly at the moment I am too lazy to get out of my bed and go look at my bookshelves! Sorry that I can’t seem to write less than a novella as a comment; I definitely am more verbose through writing than talking, and once I get going it’s hard for me to stop! I think I’d rather write all these things on actual paper, with a fountain pen, sealing the envelope with wax, etc., etc. 😉 Anyway, I am always inspired by your posts, both to think about things that matter to me as well, and also to try to shape my life into the one I want it to be. Thank you! Oh my goodness I want the Moon-Feast book! I’d never heard of it and it sound exactly like my sort of book! I have Nourishing Traditions on order, hopefully it will be here soon! I’m in the same boat with baking, I LOVE baking, and I love how pretty a slice of cake or a tart or something looks next to a cup of coffee and a book..so I bake with sugar way more than I should! My goal is to do something cozy and baked on Sundays and special feasts, and let the more functional, earthy sorts of baked goods satisfy during the week..but I have trouble with goals, and sometimes even the littlest feast day looks special! haha! um, wow, that comment looks even longer now that it is published, but I just wanted to add – I hope you and your family are feeling better soon!! Long comments are the best! And yes we are, it was a tiny thing that didn’t even last all day! Thank goodness.